Bitcoin and other cryptocurrencies use blockchain: a decentralized, public transaction ledger maintained through consensus. It’s unhackable because there are no central points of attack. There’s no company that runs Bitcoin, there’s no server that maintains a master copy of everything, there’s no person or organization to target. But most exchanges are centralized. They have servers and hot wallets in which they store users’ funds worth millions of dollars. They’re prime targets for hackers. And they get hacked, like MtGox in 2014, Bitfinex in 2016, and BitGrail in 2018. Decentralized exchanges use blockchain to improve security. Instead of relying on dedicated servers or the cloud to manage transactions, they write data straight to their blockchain, and maintain their transaction ledger through consensus. On the plus side, decentralization hardens security beyond anything a centralized exchange can offer: the blockchain is unhackable, as for any crypto asset. Most DEXs also use peer-to-peer trading – traders transact directly from their own wallets, without ever depositing funds with the exchange. Most are also more anonymous, often requiring little more than an account name or email address from traders. Some require no personal information at all, relying on a blockchain wallet address (and private keys) for identification. DEXs are far less likely to face government regulation. Or, rather, they’re less likely to be affected because there’s no central authority for governments to target. On the downside, DEXs are frequently ugly, hard to use, and have limited support. Most are run by volunteers or small groups without the funds to offer services like the centralized options. Some are pure open-source projects, with their only revenue coming from donations and trading fees. Most decentralized exchanges are also slower. Writing transactions straight to the blockchain means waiting for confirmations from miners. 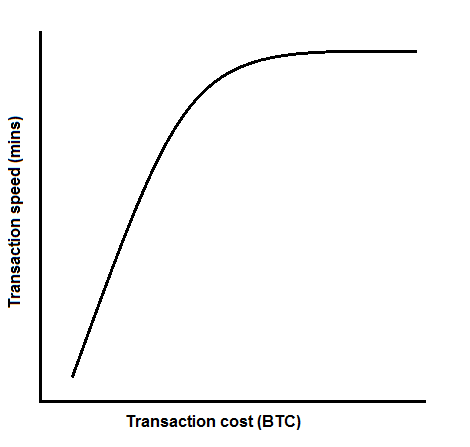 And since their fees are based on blockchain transaction costs, they’re often more expensive to use, especially at peak times. The speed, lack of support, and variable fees mean that most DEXs handle significantly lower volume than the well-known centralized options. 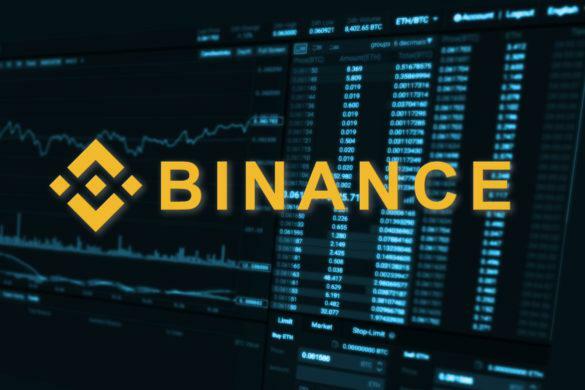 Even the largest DEX handles only a few million dollars of trading per day, compared to hundreds of millions for big names like Binance or Upbit. However, most traders choosing decentralization are willing to accept the negatives in exchange for safety, privacy, and never putting their funds in anyone else’s hands. Finally, it’s important to understand that the decentralized exchange (DEX) model is still very young. The model has a lot to offer, but a long way to go before it replaces the comfortably familiar, centralized, corporate setup. Here’s a look at ten of the best DEXs currently running. One of the biggest, most popular DEXs, EtherDelta only lists Ethereum and Ethereum-derived assets. The site uses smart contracts to facilitate trade, making it the exchange that’s closest to directly trading on the blockchain. 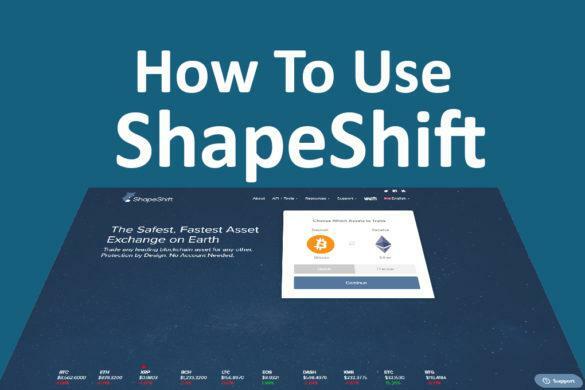 The site has no traditional user accounts and performs no real-world verification, using ETH wallets to identify traders. EtherDelta is the launch pad for the majority of new ERC-20 compliant tokens (i.e. most ICOs), making it a must for savvy investors who want to get in early. Tokens typically appear on EtherDelta long before they’re available to trade elsewhere. On the downside, the site suffers from a clunky interface and frequent lag. 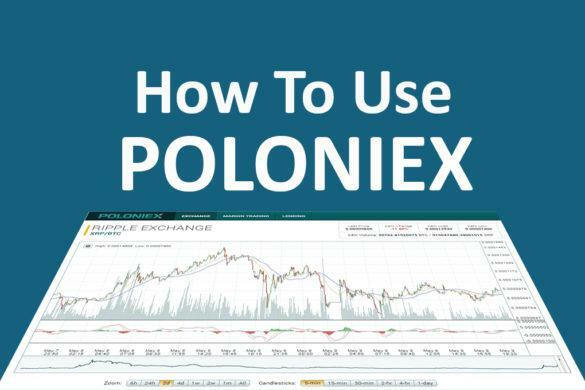 It’s also very complicated to use, especially for anyone unfamiliar with crypto and exchanges. The biggest issue for newbies is security: the site doesn’t try to be user-friendly, so spotting a phishing copy or hacked version is more difficult. Extreme vigilance required. As the name suggests, ForkDelta is a fork of EtherDelta. The site was created when EtherDelta was sold to new owners, who – in the words of the ForkDelta team – “introduced questionable development decisions”. ForkDelta strives to be open, fair, and true to their fundamental belief that crypto-projects should be built by, for, and with the consensus of the community. ForkDelta offers a huge array of ERC-20 tokens for trading on the Ethereum blockchain – the largest number anywhere, in fact. The site lists new tokens very frequently, with a simple, free process for developers to add their ICO assets. Putting aside philosophical differences, ForkDelta is the same as EtherDelta – it even uses the same smart contract and pays EtherDelta the fees. Over time, the two will grow apart as development continues in different directions. Similar to EtherDelta, IDEX is a platform for trading Ethereum and ERC-20 tokens. However, the site is a mix of centralized and decentralized trading. IDEX uses a smart contract similar to Etherdelta (and uses traders’ private keys to sign the contract), but which only the IDEX “arbiter” can sign off. As each trade completes, the arbiter sends the completed contract to the blockchain, maintaining trade order, keeping balances in synch, and offering a smoother, faster trading experience. 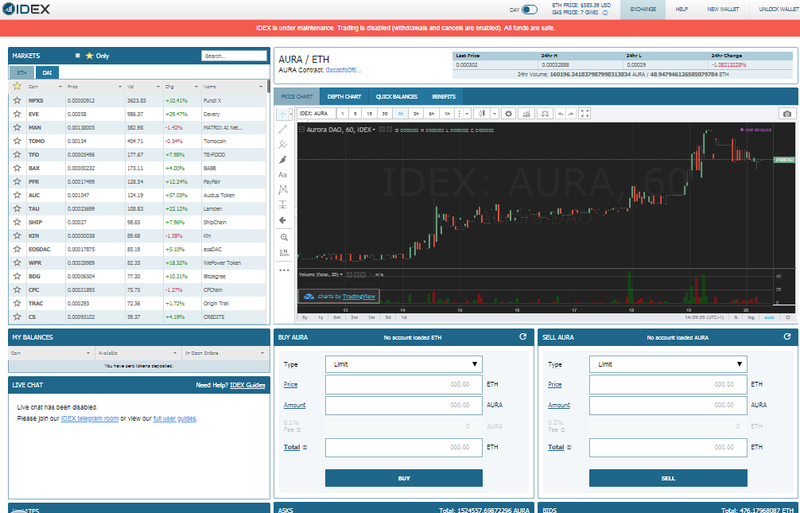 The site also has its own AURA token, with which it rewards users based on trading value. AURA is a proof-of-stake coin providing rewards for use with many of Aurora’s projects. 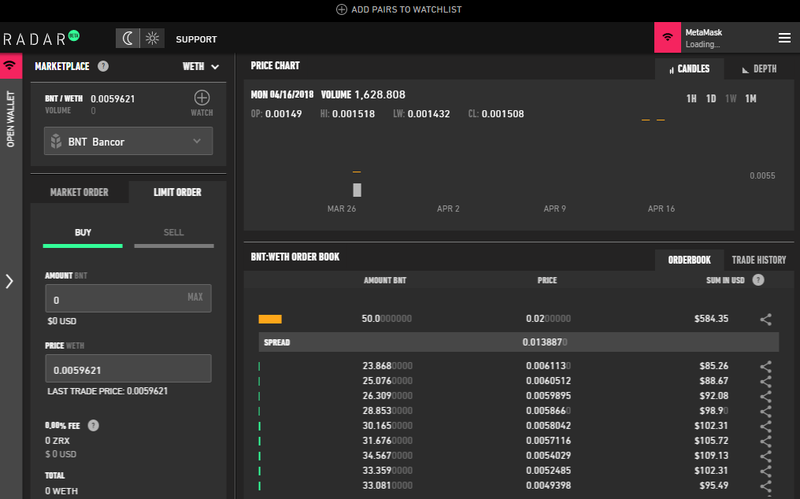 Users can also hold or trade the coin on the exchange. The main drawback of IDEX is its partial centralization. For traders who use DEXs specifically to avoid any third-party control, that’s a significant issue. 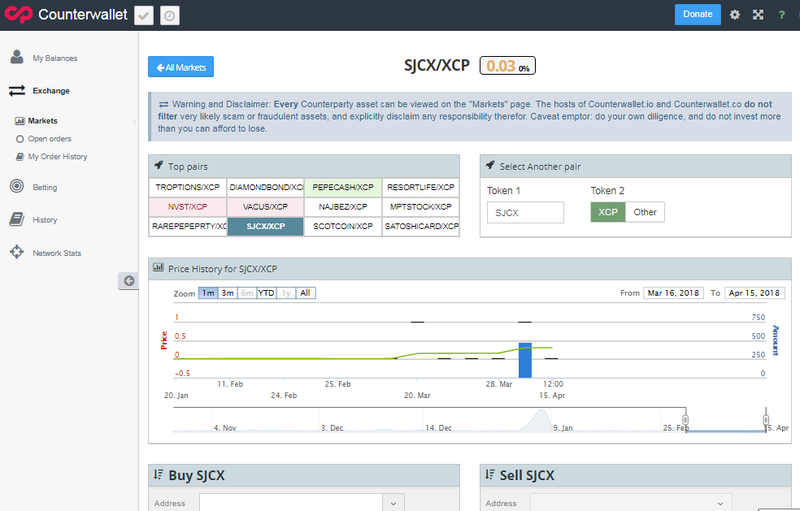 XCP DEX is Counterparty’s decentralized Bitcoin exchange. It’s an oddity because there’s no dedicated interface: you access the exchange by logging into your “Counterwallet” (also run by Counterparty). 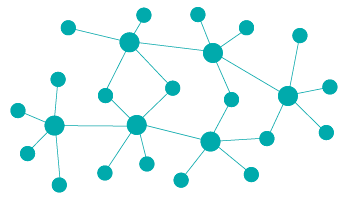 Counterparty’s exchange is an amalgam of functionalities. It allows you to create tokens on the Bitcoin blockchain – much like ERC-20 tokens on Ethereum – and to trade your own or existing tokens. The base currency is XCP (Counterparty’s native coin), though some tokens have other trade pairs, including other tokens. The biggest problem with XCP DEX is security. Most users log in using their XCP wallet’s seed phrase – thus transmitting it online – and the organization explicitly states that they do not filter any tokens on the exchange. Anything you see could be a scam. The interface and trading processes are also clunky and hard to understand. In fact, the exchange is so unfriendly to new users that there’s a walkthrough of buying and selling in the help documents. StellarTerm is an interface to the Stellar Network – the one created by the Stellar Lumens (XLM) people. It’s a small DEX, with only six coins listed: XLM, REPO, MOBI, RMT, SLT, and CNY. It’s comparatively attractive and easy to use. The exchange uses Stellar wallets to identify users, requiring transmission of your private key, though it has a Ledger login for security-minded traders. It’s one of the few DEXs offering a desktop client. 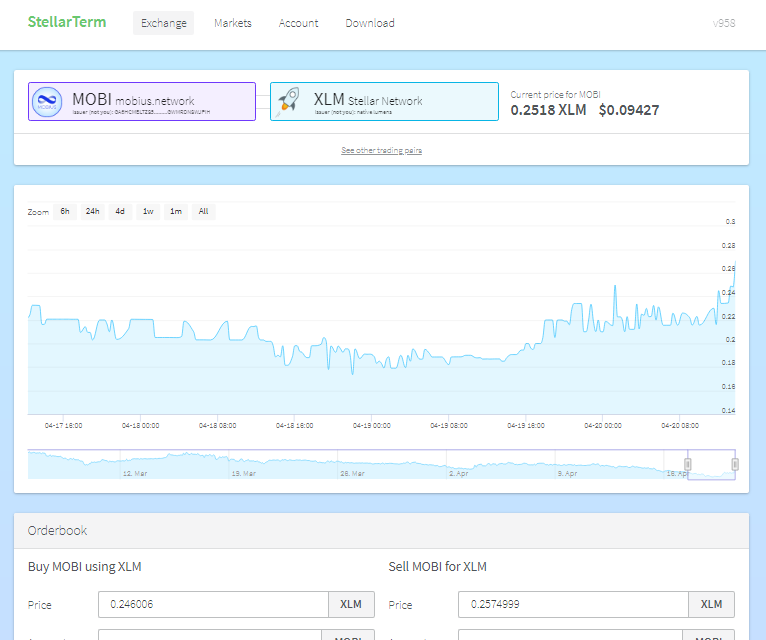 The main downside of using StellarTerm – apart from the very limited trade pairs – is that it requires a wallet deposit, currently 5 XLM, to “activate” your wallet and allow you to trade. Another mix of centralized and decentralized trading, Waves DEX is built on the WAVES platform and blockchain. Like IDEX, the centralization improves trading speed and ensures exchanges occur in the right order. 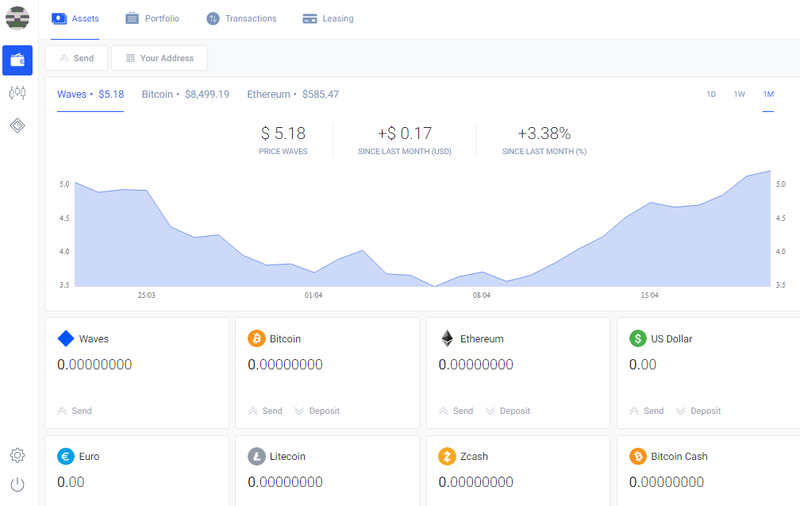 The exchange also uses traditional user accounts, complete with passwords and associated wallets (though no personal information). Waves DEX offers a comparatively broad variety of trading pairs. You can trade Bitcoin, Litecoin, Ether, Zcash, as well as other cryptocurrencies, and even fiat currencies. The platform has a desktop client, too. The main negative of the platform – apart from centralization – is that everything is based on WAVES. You must maintain a separate WAVES wallet because the DEX integrates directly to avoid holding your funds, and the fixed fees are paid in WAVES. Another ERC-20 DEX, Radar is built on the 0x (ZRX) protocol – and that’s what sets it apart from the other DEXs. The 0x protocol maintains an off-chain secondary ledger of orders to improve speed and accessibility, only writing completed and confirmed transactions to the ETH blockchain. Radar is like EtherDelta in that it requires no sign-up, maintains no accounts, and requires no deposits or withdrawals. You trade directly to and from your ERC-20 compatible wallet. The site has Metamask, Ledger, Parity, and Mist integration built in, but only works with those wallets. If you use MyEtherWallet or another Ethereum option, you’ll have to connect your existing wallet to one of those services or start fresh. It’s a proper – and very smooth – trading platform, with charts, order books, base pairs against WETH and DAI, and a growing list of tokens to buy and sell. All fees are paid in ZRX, but you don’t need to hold any to trade: the app converts and takes fees out of each trade. The negative? It’s reliant on the 0x protocol, which means a secondary blockchain and putting a certain amount of trust in the third party responsible for it. OpenLedger is built on BitShares’ graphene. It’s a full-blown trading platform that tries to be more than the average DEX by offering Bitcoin pairs, altcoin pairs, and fiat trading via the site’s own BITUSD and BITEUR assets. The site offers two account models: wallets, connected directly to your unique computer/browser pair and offering high security, or accounts, which gather all the coin options into a traditional user account setup, accessible from anywhere (but less secure). Like BitShares, OpenLedger uses its own currency to pay fees, though the advanced trading model allows you to select other payment currencies. 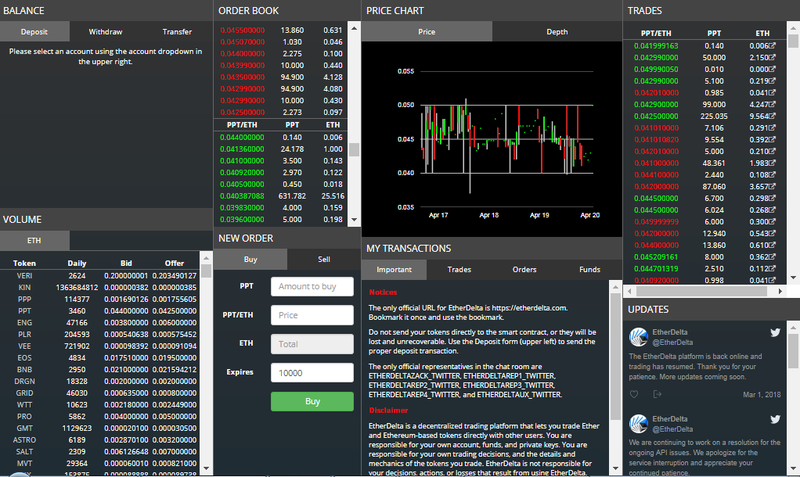 The biggest drawback of OpenLedger is the unfriendly interface and complex trading process. Broken links and limited information on the main website are frustrating and reduce usability. The account model also requires deposits in the traditional way, putting your funds into the exchange’s hands. Kyber aims to be “the future” of DEXs, attempting to offer everything traders expect from centralized exchanges. Those plans are still in their infancy as, for the moment, Kyber is primarily a token-exchanging protocol. Unlike most DEXs, Kyber works by maintaining liquidity that users can tap into to exchange tokens: instead of buying or selling, you’re sending or receiving ERC-20 tokens at predetermined rates. It’s less like a trading exchange and more like a huge token warehouse, with third parties stocking the warehouse for exchanges. 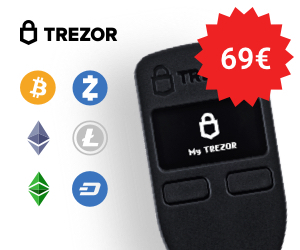 Integration is impressive, with Metamask, JSON, Trezor, Ledger, and private key logins to allow exchanges direct from your ERC-20 wallet. There are no traditional accounts: you swap tokens without depositing. The main drawback of Kyber is that it isn’t a crypto exchange in the commonly accepted sense: it’s a complex token swapper. 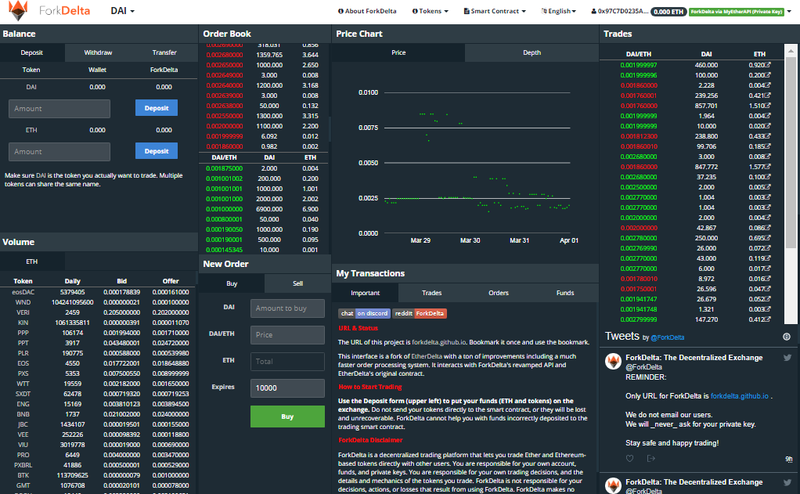 At present, Kyber has none of the peripheral extras required for informed trading – no charts, no buying or selling queues, no background information at all. Similar to Kyber, the Bancor protocol allows you to exchange between ERC-20 tokens. Bancor integrates with messenger apps – Telegram, WeChat, and Messenger at this time – where a bot handles your Bancor wallet setup. There are no Bancor accounts as such: you can set up a new wallet or import any existing ERC-20 compatible wallet. The site acts as an interface for your wallet: you don’t deposit funds. 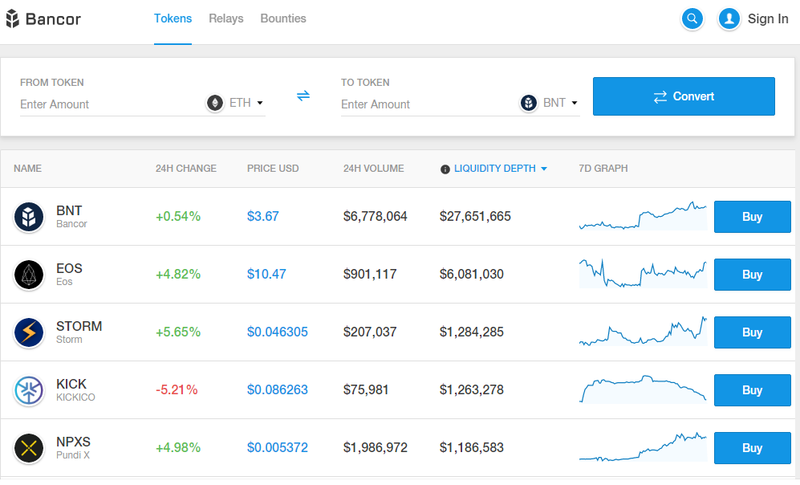 Bancor opts for a more trader-friendly interface, with each coin’s price, change, volume, liquidity depth, and price chart displayed. You can buy tokens or “convert” (i.e. exchange) as required. On the downside, none of that extra information has much purpose. Bancor is simply a token-swapping site. 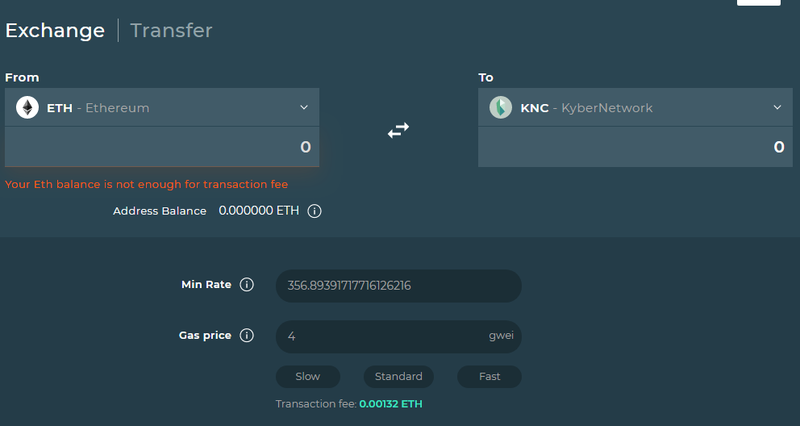 You can’t even set desired prices as you can on Kyber: you must accept the current rate. The decentralized exchange model is still very young, but there are multiple other players in the space. Notable names include Bisq, Cryptobridge, Blocknet, ERC DEX, ParaDex, DUBIEX, DDEX, and Altcoin.io. The best DEX depends on what you’re looking for. EtherDelta and ForkDelta offer the largest number of ERC-20 tokens. 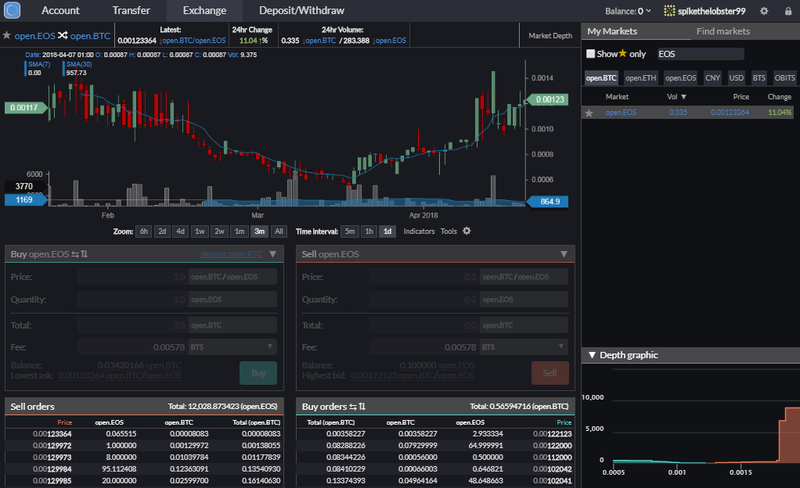 IDEX and Waves DEX have much smoother interfaces. Radar Relay has a good mix of both. Kyber and Bancor make exchanges simple by reducing trading options. Overall, the decentralized exchange model focuses primarily on assets that are otherwise hard to trade. Competing with the huge centralized exchanges (which typically trade hundreds of times more volume every day) is simply not possible, so they build their following by offering specialized services. For most traders, choosing a DEX is simple: you find one that has the token you want. You’ll usually have to live with an unfriendly interface and clunky processes, but that’s the price for getting in early on ICOs that are likely to moon!